Smålands snus is a popular tobacco product from Swedish company, Skruf. With the arrival of Smålands to the snus scene, customers are now offered a more affordable snus to enjoy that doesn’t mean having to compromise on quality. 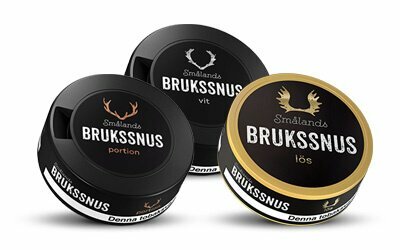 Skruf has followed the traditional route with Smålands and produced a pure tobacco snus. The tobacco flavour is infused with hints of bergamot and citrus and it carries an undertone of grassy meadow. Smålands has been styled as a very simplistic brand, but the tobacco’s taste certainly has an enjoyable bite to it, and it is in no way a bland snus. The nicotine content in Smålands is fairly low, at around 8mg per portion, making it perfect for those who prefer to keep their nicotine consumption low. Smålands is presented in a smaller than average size and is not a snus for keeping in the mouth for long periods of time. This snus is for those snus users who love to get a quick hit of nicotine and a burst of flavour, without having to hold a large bulky portion under the lip for longer than necessary. Smålands is designed to be a smaller and less expensive option that can be used more regularly for shorter periods of time. With Smålands there is less waste and more enjoyment. Although there is no rose oil component as in other products from Skruf, this doesn’t mean that the flavour has a missing link; it’s simply a more subtle variation of the theme. The Bergamot shines through and carries with it that sought after hint of citrus. The hint of grass is strongest upon opening the can and getting the first burst of aroma. Whilst the cheaper aspect of the brand is of course a big draw, the flavour and quality of the tobacco is equally reassuring. The small portion sits extremely comfortably inside the mouth, for a sweet snus hit that will take the edge off any nicotine craving. Smålands has attractive packaging; its small round tin is comfortable and convenient to carry and comes as original, white and loose. Those who like their snus to be a little drier than usual should go for the white snus; white snus does not go through the final process of having water added and is therefore a non-drip snus. Loose snus is more robust in flavour and gives the user more flexibility in portion size. Original is just as the name suggests; original snus that never goes out of style. Skruf is a snus company that was developed much more recently than many other snus companies. It was established only in 2002 by two friends who had big dreams. The aim of the two entrepreneurs behind the company was to offer top quality premium snus to their clients, snus that they themselves would want to use. Skruf is the company behind the Smålands snus brand. Skruf has three very distinct brands under its name: Skruf, Knox and Smålands. Each of these three brands caters to different clientele, and has different characteristics that allow customers to choose the perfect snus to suit their preferences. Following the current trend of creating more affordable snus for the populace, Smålands was developed. Smålands is both manufactured in and named after a small province in Sweden, and means ‘small lands’. With the recent influx of cheaper brands being released on the market, Smålands is a prominent offering. Smålands snus brand caters towards the younger generation and also to those who need to use snus but are on a tighter budget. It is in fact one of the least expensive products on the market, though this has in no way affected its efficacy. With subtle flavours, and slightly less nicotine content, Smålands is able to be a more affordable brand for clients. This is in accord with the aim of the company, to be accessible to all.